Photography on a rainy day can be as awesome as you want! Here. 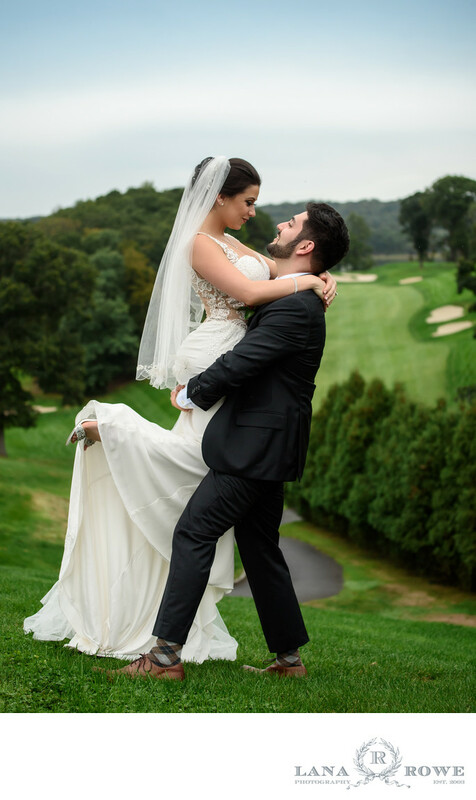 Janine was swept off her feet by her handsome husband! What you can't see clearly from this image is that it was raining! There was a slight drizzle most of the day. The mist added to the magical feeling by creating very soft, dreamy light. So grab an umbrella and let's head out-we got this! Many brides worry about the possibility of rain on their wedding day. I always tell them not to worry! As long as we are prepared we can make it work! A clear umbrella and and efficient set up (on our end) allows for a few minutes of photography even if the rain continues. When there is a will, there is a way! This stately mansion offers the perfect setting for an intimate wedding reception. Nissequogue Golf Club in Saint James, NY is a private club hosting exclusive events in a scenic setting overlooking the Nissequogue River.